(Nanowerk News) PI’s new N-565 compact, nanometer-precision linear stages are designed for high-end applications in bio-nanotechnology, fiber-optics, microscopy, semiconductor testing, and metrology and scientific research in beamlines and laser labs. Due to the fully integrated linear piezo motor, the low-profile stages have a very small footprint with a width of only 65mm and length from 80mm. Travel ranges 1/2”, 1” and 2” are offered in 13, 26 or 52 mm. An integrated interferometric linear encoder developed by PI can resolve to 20 pm and allows incremental motion below one nanometer. Due to the short signal period of 0.5µm, the linearity error of PIOne encoders is less than 1%. 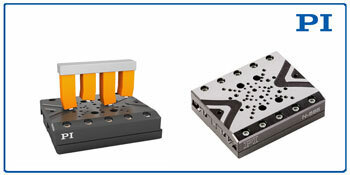 The PiezoWalk® technology combines the technological advantages of piezo class resolution with long travel ranges: they offer subnanometer resolution, high forces, and high stiffness. In contrast to conventional long-travel piezo-motor principles, PiezoWalk® stepping drives are not subject to sliding friction effects and virtually wear free motion is achieved, because the “legs” lift off for each step. Preloading the actuators against the runner ensures a self-clamping force even when powered down and the piezo stepping drive holds a position mechanically stable without servo jitter and energy consumption. PiezoWalk® motors were developed for the semiconductor industry over a decade ago and provide extreme reliability. With crossed roller bearings, the point contact in ball bearings is replaced by a line contact of the hardened rollers. Consequently, they are considerably stiffer and need less preload, which reduces friction and allows smoother running. Crossed roller bearings are also distinguished by high guiding accuracy and load capacity. Roller creep is prevented by active cage assist. The PiezoWalk drive is designed to run on a maximum voltage of 45V. Several controller options are available: stand alone, OEM card, rack mount, and multi-axis controllers with coordinate transformation for parallel-kinematics applications. For start-up and system configuration, the PIMikroMove GUI is included, as well as LabView drivers and DLLs.